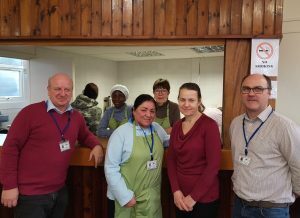 The grant from Sandwell Council will help with developments at the Friday Community Café, run by a team of volunteers in Smethwick. As well as supporting the training and development of volunteers, some of the grant will go towards the cost of a volunteer co-ordinator and a monitoring officer. It provides practical help to those in need and supports people to realise their full potential through befriending, listening and education. Brushstrokes is based at St Philip’s Parish Centre, Watt Street, Smethwick B66 3DA. This entry was posted in Uncategorised by Caritas. Bookmark the permalink.